Picture your life in a tiny home with solar. No, really. Close your eyes. What would your home look like? Your Kitchen? Your living room? You're free to really make the space your own without a landlord restricting your choices. When you go to the mailbox, there's never a rent check you have to send or a power bill you have to pay. You know your carbon footprint is drastically reduced. Your life is simple and independent. This doesn't have to be just a daydream! It's totally within your reach, and we want to show you how. We've got expert, friendly technical support and a ton of options so that you can be sure your solar system will be the right fit for your tiny lifestyle. We're excited to help you get started. This page is dedicated to arming you with the knowledge you need and the questions you should be asking yourself to get started planning your solar powered tiny home. 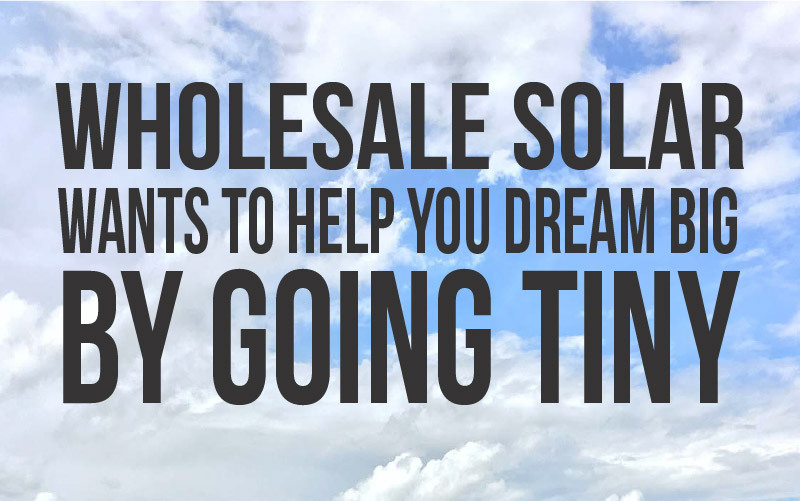 At Wholesale Solar, we've been designing and selling systems direct to homeowners for 20+ years, and we're excited to see a new generation embrace off-grid living. Unlike installers who want to give you cookie-cutter systems, our specialty is in working with DIY and small homeowners to customize every aspect of a system to your needs. We offer expert design and tremendous flexibility both in choosing the right kind of system and in figuring out where to best place it. No matter your familiarity with home solar -- from absolute beginner to regular DIYer -- our team of experts is ready to help you design the perfect system and installation for your tiny home. Want to see exactly how solar works with tiny homes? We paired up with Tammy and Logan from Rowdy Kittens to show you just how it looks and what it takes to get your tiny home set up with solar. Love Tammy and Logan's tiny home? 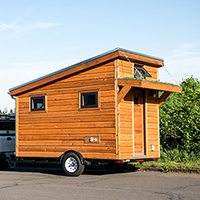 It's the Kozy Kabin build from Portland-based tiny homes company PADtinyhouses! See more of the Kozy Kabin here. And check out The Acorn tiny home solar system if you are interested in a similar solar setup. What's the Right System For You? Ask yourself these 3 questions to find out. 1 What are my energy needs? This is the most important question to ask yourself before going solar. The size of your solar system depends on the amount of electricity you use, or plan to use, every month. And it's tempting to think that a smaller home automatically means less electricity use, but that isn't necessarily the case! Do you mind downsizing to a smaller refrigerator, or do you need a standard-sized one? Do you look forward to a fresh cup from the coffee machine every morning? Are you okay with an electric stove/oven, or would you rather cook with propane? Understanding your current energy use and deciding which habits you'd like to keep or change is the first step in estimating your energy usage in your tiny house. Sound complicated? We can help. At a basic level, you can estimate your current electricity use by looking at your utility bill or using tables that show common appliance power draws. If you'd rather not estimate, there's a simple, inexpensive way to get real time data from your own home. The Neurio Home Energy Monitor is designed for you to get to know your personal energy needs, and then lower your use as well as your utility bill. It's as good for your wallet as it is for our Earth. You can install the Neurio on your home's energy panel in minutes, then download the accompanying app and you're ready to go. There couldn't be a better tool to help you downsize for solar. 2 Where will my panels go? With tiny homes, panel placement is a different story than with adding solar to a larger home. 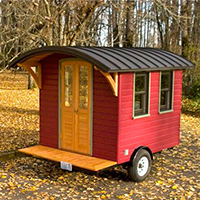 And if you plan to take your tiny home on the road, there's even more options! By far the most common option for tiny home owners is an array of solar panels mounted on the ground. This is called, unsurprisingly, a ground mounted system. There are a lot of reasons why ground mounted systems are the most popular option when it comes to tiny homes. 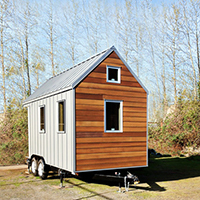 First, the most obvious: tiny homes have tiny roofs! You can fit two or three panels on the roof of your average tiny home, which won't be enough to cover most people's energy needs -- even in a tiny home. With a ground mounted system you can have as many panels as you need. Ground mounted systems are also great because you can put them wherever you have the space for them. That means you can point them where they'll be the most efficient, and position them to get the most amount of sun based on your property. They're also easier to access if you need to brush snow or debris off of them. When most people think of solar, they picture the panels on a roof. Roof mounting is classic and looks cute, but for tiny homeowners, it only makes sense for a small number of folks. This option is for those who have drastically low solar electricity needs since you can only fit two or three panels on the roof of a tiny home. This option might be for you if you are using solar to supplement another source of electricity, or if you plan to use just enough power to keep your lights on. The reason roof mounting is so popular with larger homes is that they're often in residential areas that lack the space for a ground mounted system and they're often tied into the local power grid. With many tiny homes, there's both enough space for a ground mounted system and tying into the local power grid isn't an option. We don't mean that your panels will literally go on the road! Just on the road in the Jack Kerouac sense. 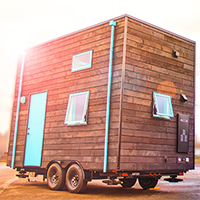 If you're going to be completely mobile, designing your tiny home to go anywhere and everywhere with you, you'll need a solar solution that you can move securely. From a ground or roof mounted system that you can pack up, to a trailer that you hitch to your tiny home, there are solar solutions for you. 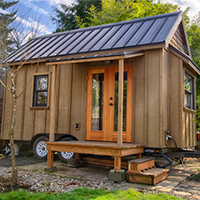 If you want to see one great example of a mobile tiny home with solar, check out our friend and tiny homes pioneer Dee Williams's build here on her blog. Just give our solar experts a call and we'll work with you to figure out the right design for your mobile setup. 3 What are my goals? Most people who decide to go tiny are looking for the independence and simplicity of going off-grid. 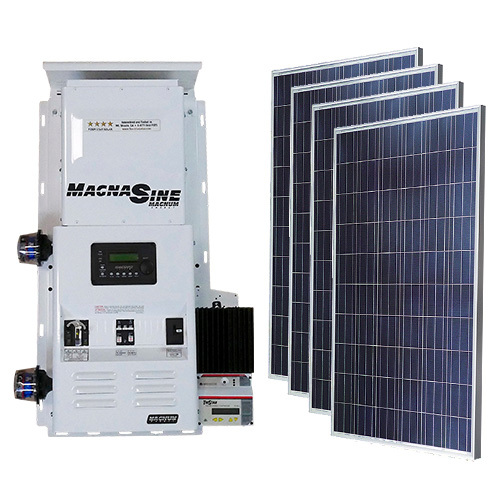 But there's another option as well: connecting your tiny home solar system to your local utility grid and selling them electricity. Find out the best option for you below. If you're going tiny, you're interested in downsizing your life, the amount of stuff you own, your footprint on our green Earth, as well as your cost of living. 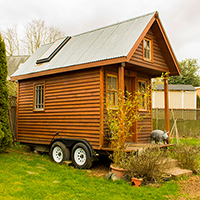 One of the most natural ways to accomplish these goals is taking your tiny home off grid. Off-grid systems use solar panels and batteries to store electricity and ensure your energy needs are met. 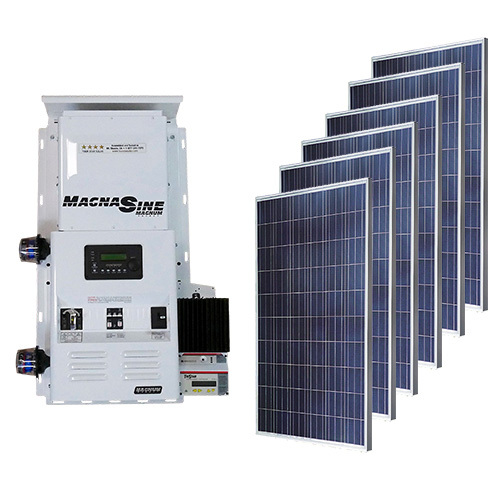 And with an off-grid solar system, you never lose power regardless of what the local utility grid is doing. 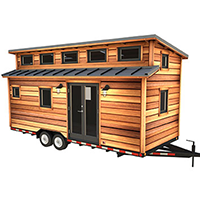 If your tiny home will be in an urban or residential area, perhaps on the property of a larger home, you might want to consider tying your solar system into the grid and selling them the electricity you are creating. When we talk about "the grid", we're talking about the power grid that your local electrical utility company provides. Grid-tied systems send the solar electricity your system makes to the grid, and you get credits towards your bill for the power you are creating. No tiny home yet? Check out these great options from our featured builders. We've paired them with our solar systems based on size, but these are simply rough estimates. 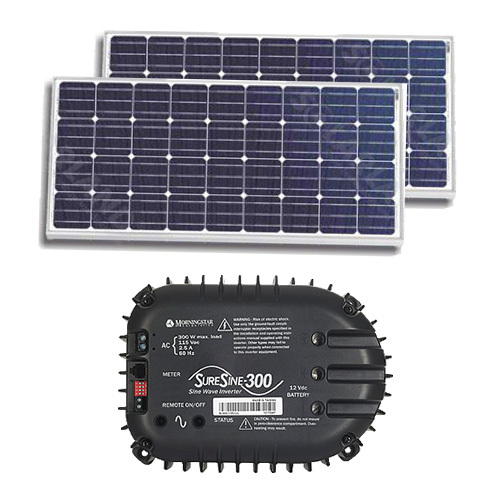 One of our solar experts will help find which system is right for your needs! 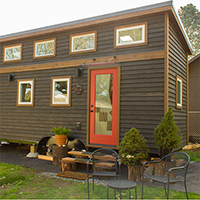 No matter your energy needs, we've got a system that's right for your tiny home. Whether you have lots of questions or are ready to get a quote, give our solar experts a call and we'll get you set up.